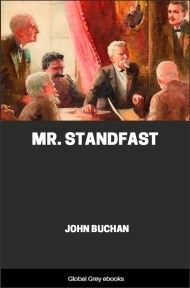 Mr Standfast is the third of five Richard Hannay novels by John Buchan. It is one of two Hannay novels set during the First World War, the other being Greenmantle. 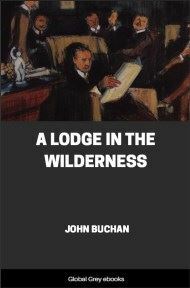 The title refers to a character in John Bunyan's Pilgrim's Progress, to which there are many other references in the novel. Set in the later years of World War I, Brigadier-General Hannay is recalled from active service on the Western Front to undertake a secret mission hunting for a dangerous German agent at large in Britain. Hannay is required to work undercover disguised as a pacifist, roaming the country incognito to investigate a German spy and his agents, and then heads to the Swiss Alps to save Europe from being overwhelmed by the German army. I spent one-third of my journey looking out of the window of a first-class carriage, the next in a local motor-car following the course of a trout stream in a shallow valley, and the last tramping over a ridge of downland through great beech-woods to my quarters for the night. 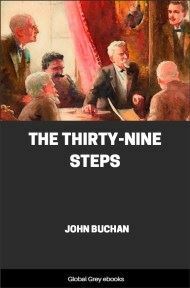 In the first part I was in an infamous temper; in the second I was worried and mystified; but the cool twilight of the third stage calmed and heartened me, and I reached the gates of Fosse Manor with a mighty appetite and a quiet mind. As we slipped up the Thames valley on the smooth Great Western line I had reflected ruefully on the thorns in the path of duty. For more than a year I had never been out of khaki, except the months I spent in hospital. They gave me my battalion before the Somme, and I came out of that weary battle after the first big September fighting with a crack in my head and a D.S.O. I had received a C.B. for the Erzerum business, so what with these and my Matabele and South African medals and the Legion of Honour, I had a chest like the High Priest's breastplate. I rejoined in January, and got a brigade on the eve of Arras. There we had a star turn, and took about as many prisoners as we put infantry over the top. After that we were hauled out for a month, and subsequently planted in a bad bit on the Scarpe with a hint that we would soon be used for a big push. Then suddenly I was ordered home to report to the War Office, and passed on by them to Bullivant and his merry men. So here I was sitting in a railway carriage in a grey tweed suit, with a neat new suitcase on the rack labelled C.B. The initials stood for Cornelius Brand, for that was my name now. And an old boy in the corner was asking me questions and wondering audibly why I wasn't fighting, while a young blood of a second lieutenant with a wound stripe was eyeing me with scorn. The old chap was one of the cross-examining type, and after he had borrowed my matches he set to work to find out all about me. He was a tremendous fire-eater, and a bit of a pessimist about our slow progress in the west. I told him I came from South Africa and was a mining engineer. 'Been fighting with Botha?' he asked. The second lieutenant screwed up his nose. 'Thank God there isn't,' I said, and the old fellow begged permission to tell me a lot of unpalatable things. I knew his kind and didn't give much for it. He was the sort who, if he had been under fifty, would have crawled on his belly to his tribunal to get exempted, but being over age was able to pose as a patriot. But I didn't like the second lieutenant's grin, for he seemed a good class of lad. I looked steadily out of the window for the rest of the way, and wasn't sorry when I got to my station. I had had the queerest interview with Bullivant and Macgillivray. They asked me first if I was willing to serve again in the old game, and I said I was. I felt as bitter as sin, for I had got fixed in the military groove, and had made good there. 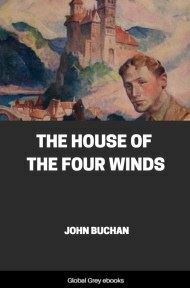 Here was I—a brigadier and still under forty, and with another year of the war there was no saying where I might end. I had started out without any ambition, only a great wish to see the business finished. But now I had acquired a professional interest in the thing, I had a nailing good brigade, and I had got the hang of our new kind of war as well as any fellow from Sandhurst and Camberley. They were asking me to scrap all I had learned and start again in a new job. I had to agree, for discipline's discipline, but I could have knocked their heads together in my vexation. What was worse they wouldn't, or couldn't, tell me anything about what they wanted me for. It was the old game of running me in blinkers. They asked me to take it on trust and put myself unreservedly in their hands. I would get my instructions later, they said. I asked if it was important. 'Is it risky?' was my next question. 'In the long run—damnably,' was the answer. I looked at Bullivant's shrewd, kind old face and Macgillivray's steady eyes. These men were my friends and wouldn't play with Me.